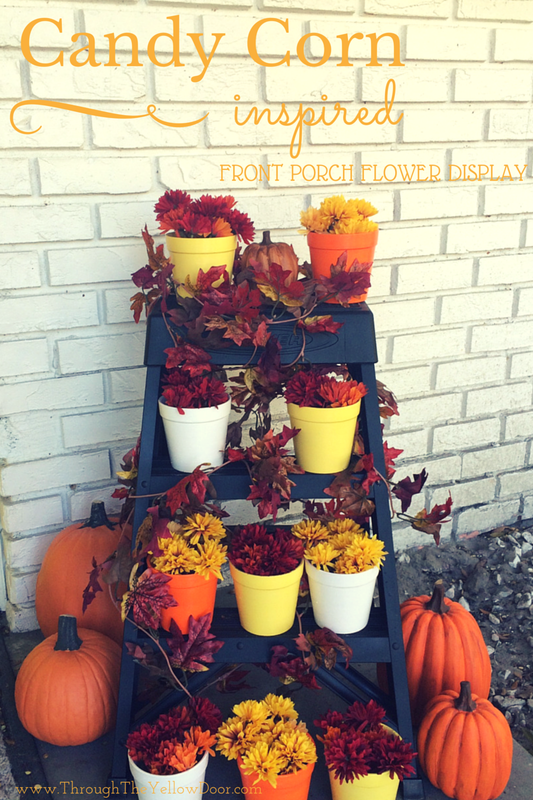 I've been slowly working on putting together a Fall front porch display that is finally coming together. I knew I wanted to display many plants with a limited amount of space, so I decided to utilize a step-ladder. 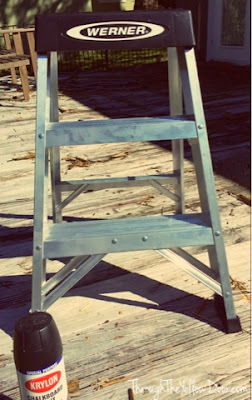 However, the step-ladder was not pretty, it was just your standard metal ladder everyone has in the garage, so it needed a quick make-over. I had some black chalkboard spray paint in the garage and since I wanted the ladder to have a matte appearance, I decided to use it. 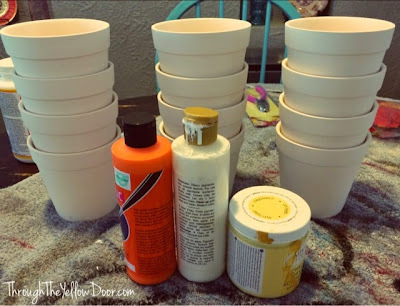 Two quick coats and done, let it dry and move on the the fun part - painting flower pots! I had a dozen ceramic flower pots from Oriental Trading I'd been wanting to use, so this was the perfect opportunity. Since I'm going for a Fall theme and don't want to be tied to Halloween (want to extend the display until after Thanksgiving) I decided to go with "candy corn inspired" colors (yellow, orange and white). 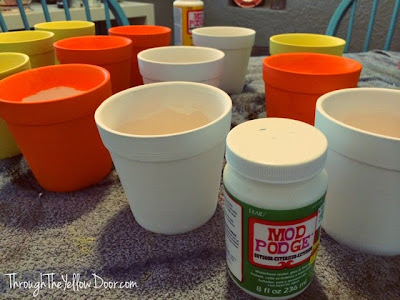 After each one was painted and dried, I applied a layer of Outdoor Mod Podge formula since they might be exposed to the elements even if they are covered on the porch. 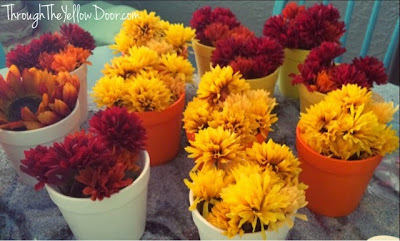 Once the Mod Podge was dried, I added in some different colored mums. Now, let it be known that these are totally fake mums, we live in Orlando and I've tried to have real mums before. They last a few weeks in this heat and then they shrivel up and die, so this time I went the artificial route. 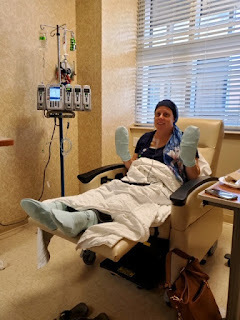 Again, because they were going to be outside, I wanted to protect them from the elements. So I sprayed some aerosol sealer over them (clear coat). 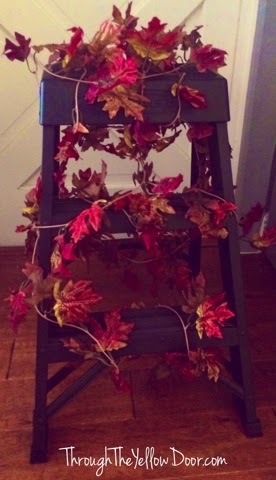 I did the same with the Fall foliage vine I wrapped around the newly painted step-ladder. 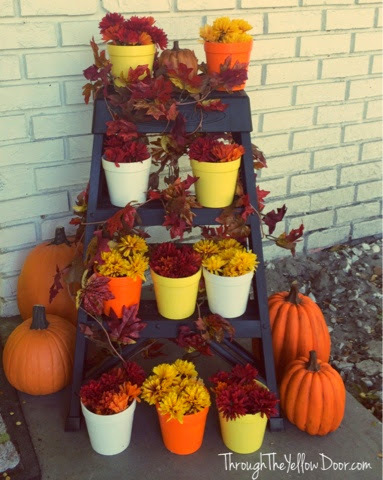 Last step was to take the ladder outside and arrange the candy corn inspired flower pots. I added in some existing painted ceramic pumpkins for added Fall flare. I'll add some real carved pumpkins as we get closer to Halloween (they don't last long before molding/dying here in Florida either). How creative. I totally love this!! !